Okay, on with another continent of the Olympics – the Americas. I have had a few suggestions for US and South American treats, but a big thank you to readers Karen and Emmy for their suggestion of Nanaimo Bars, which hail from Canada. I love Canada. It is a truly beautiful country. I have relatives on the west coast, in Langley, BC but never managed to get across to see them. But I have been to the east coast, several years back, to visit cousins of Disneyboi. We were based in Toronto, visited Niagara Falls and stayed in Montreal for a couple of nights. If you ever get a chance to go visit these places, and have never been, go without hesitation! I looked into Nanaimo bars and Karen who e-mailed me, told me that these are eaten quite a lot at Christmas time. The ingredients didn’t seem to me to be too Christmassy, else I might have saved them to make toward the end of the year. So, for the Americas I have plumped for these beauties, a chocolate and nut biscuit base, topped with a custardy cream type filling and topped with some plain chocolate. Delish! Preheat your oven to 180oC. Line a 9”x9” baking pan with a sling of greaseproof paper. This will make lifting the bars out easy at the end. 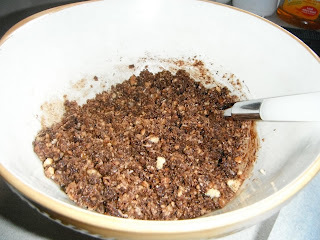 In a bowl, combine the digestives, coconut, cocoa, sugar and walnuts. Pour over the melted butter and beaten egg and with a fork work it altogether. Pat this mixture into the baking pan, so it is level. Pop the tray into the oven and bake for about 10 minutes. Remove from the oven and allow to cool completely. With an electric mixer, mix the butter, custard powder, vanilla, icing sugar and milk. The filling should be pliable but if too thick add a little more milk. 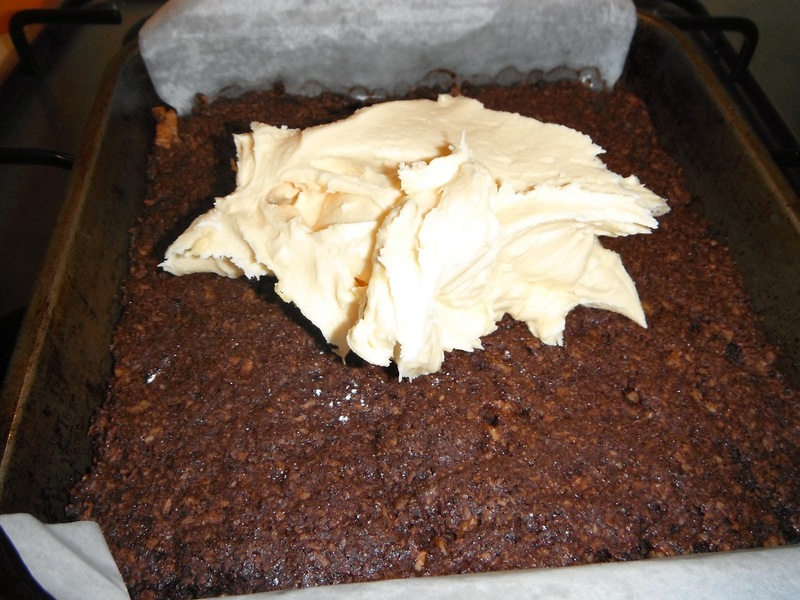 Taking a spatula, spread the filling on top of the biscuit base so it is nice and even. Stick this in the fridge to set for at least one hour. Place the chocolate and butter in a bowl, over a saucepan with simmering water in it Stir until the butter and chocolate have melted and are combined. Pour this over the top of the custard filling, spread evenly and pop back into the fridge to set for about another hour. Remove the block of Nanaimo from the tray (this is where the sling is very handy) and on a cutting board, using a sharp knife, cut into bars. I cut mine into about 24 pieces, you could do as many as you like. These were a huge hit in my office. The crunchy base, combined with the custard filling is decadent and the final topping of chocolate is great. The darker the chocolate the better, as it cuts through the sweetness of the custard. Now, tuck in! Ahh this is so funny! We are moving to BC next month and I was literally browsing apartments in Langley online just this afternoon! 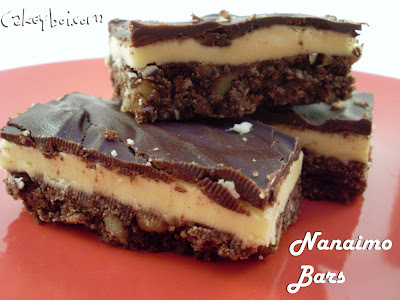 I have never tried a Nanaimo bar yet although I plan to visit Nanaimo when we're there and go on the Nanaimo bar trail where you get to try all the different Nanaimo treats the town has to offer! love that big custard layer you have in the middle! Spooky things like this keep on happening Gem! Great that you are moving to BC! These were amazing I have to say!! Very nice! Sometimes at Christmas, we put mint oil in the custard and colour it green...also deelish! What a great idea! Might just have to give that a try toward the festive season! Thanks Shuttergirl!! Mmmmm, these sound so decadent! Canada is incredible! We've loved each of the regions that we've visited, but I've never been to the B.C. and would love to visit someday! My surgeon is Canadian and I'm so glad he's here. I follow lots of great foodie bloggers from Canada too. Roz - you must give me a few names of Canadian foodie bloggers please! Yay! So glad you chose to do a classic recipe from Canada (I'm from Toronto) We eat Nanaimo bars year-round - it's my hubby's favourite dessert so there's always a box or two hanging about in our fridge! I'll have to try this recipe soon! Hi Stephanie, you must let me know if these turn out like true Canadian ones!! Yummy! Canada's Nanaimos bar will surely be an everyday recipe and not just for Christmas. The ingredients and instructions were simple and eveyone can do it.